Last week, I tracked down an explanation for why the glass roof on the Tesla Model 3 looks vibrantly orange under certain conditions, and one of our readers brought up something else that was interesting. Evidently the Subaru SVX had different colored window tint depending on the car’s interior, so I decided to track that down, too. It turns out the different colored tints were actually paired to the different interior colors available, which Subaru confirmed to me by sending me the following spec sheets. It’s easy to think the glass tint could be paired to paint jobs, though, as the gray cloth interior was not available in every paint color offered on the car. As you can see from the screenshots above, the specialized window tint started on 1993 cars, pairing bronze tinted solar reduction glass on cars with a beige interior, and what appears to be the most common neutral tinted glass on other models. And then in 1994, Subaru introduced a blue/green tint for cars with a gray interior. Not just satisfied with some boring screenshots of company spec sheets, I kept digging and found an old Japanese brochure for the 1995 Subaru SVX, which features this handy little diagram of the window tint and interior color combinations. Since it’s in Japanese, I had my Japanese-speaking colleague, Kotaku’s Tim Rogers, take a shot at translating the image captions for me. His translation confirms that the top image specifies bronze “front-glass,” (read: windshield) for the car with the beige interior. Oddly enough the bottom caption, where the car’s glass is clearly tinted a blue/green color, doesn’t mention the different tint. Instead it just details the silver body color, mentions UV glass, and the gray interior. You can access the full brochure this diagram was pulled from here. As for why Subaru decided to offer different colored tints, I’m not sure if it was purely aesthetics to better match the vibe of the different colored interiors, or if there were practical purposes for possibly preserving the quality of the interior based on the different colors, beyond it being solar protective glass, and all that. Either way, the different tints on the windows were another neat element of Subaru’s theme for the SVX, which was essentially design being informed by the technology implemented into the car. Issue number 85 of Car Styling Magazine from 1991 doesn’t mention the tinted glass, but it does touch on the approach Italdesign was brought in to execute with the design. The curved glass that solidifies the SVX as a Radwood highlight these days was inspired by Subaru parent company Fuji Heavy Industries’ aerospace engineering. The designers wanted the SVX cabin to feel like a cockpit, so having a finely tuned bronze or blue color palette to pair nicely with the interior trim likely helped solidify that theme. Today, it’s surprisingly difficult to find examples of each color tint without relying completely on assumption. I’m going to try anyway. As some SVX owners have discussed on the Subaru forums, sourcing replacement bronze windshields has become prohibitively difficult. According to one forum member who reached out to Subaru about the issue in 2016, there was a new production run of the blue tinted windshields, but only the blue. 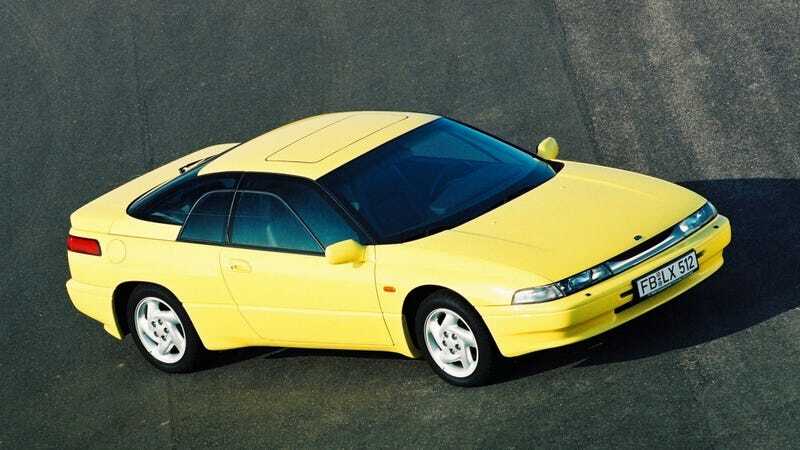 So just be wary that the used SVX market may soon be full of cars with mismatched tinted glass, if it isn’t already.